Hi, we are the Jenna Bean Team! 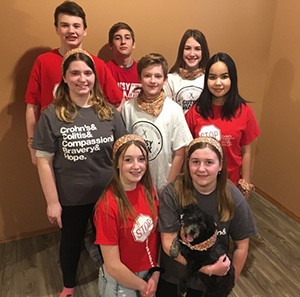 We are excited to be the 2019 Winnipeg Gutsy Walk Honourees. We have been part of the Gusty Walk since 2015. I, Jenna, was diagnosed with Crohn's disease at the age of 10. I became very sick and it took a long time for the Dr’s to find out what was wrong. I was missing school, felt tired all the time and did not have the energy to do much of anything. My friends were all very concerned. After my diagnoses it took a long time for me to get better. My friends were with me every step of the way. I told them what was happening and how I was feeling. Whenever I was having a hard day they understood. They made sure I was a part of their activities even if we needed to make some adaptations. I want other kids like me to understand that this disease does not need to impact your friendships. Be honest and tell your friends what is happening. True friends will understand and support you in times you need it the most. The Jenna Bean Team is made up of a group of My closest friends and family. We have raised funds in the community by hosting a paint night, school bake sale, pizza and subway lunch. Friends, family and community have been a huge support for the Jenna Bean Team. Sharing the awareness of Crohn's and colitis is an important part to increase knowledge, research and understanding of the challenges that people diagnosed with this disease face each day. I feel so thankful that I have such a wonderful group of friends that have helped in the hardest of days and continue to be a great support. This is why having them stand beside me as honourees this year is very special to me.